We have been spending the last few days on the coast in a little surf town called Santa Teresa. 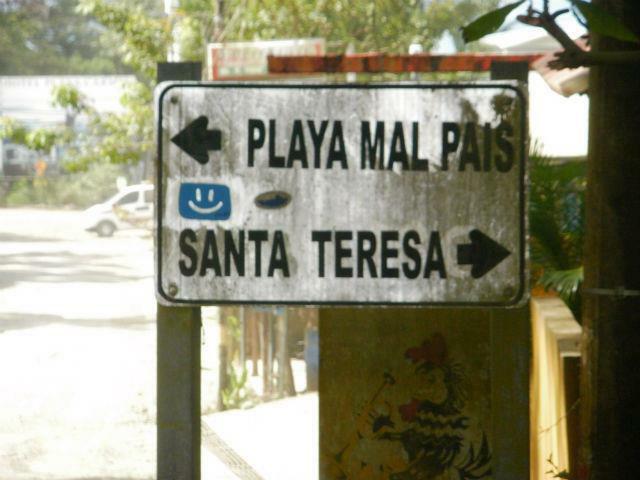 Santa Teresa is right next to another town called Mal Pais which means “bad country” in Spanish. I wouldn’t necessarily call it bad country, but it is a little bit like the wild west. The town is on the southern tip of the Nicoya Peninsula. We took a ferry from Puntaranus to Paquera. Then another hour drive to the coast on the other side of the peninsula. Most of the road was paved to the town of Cobano, then the rest of the roads to Mal Pais were pretty beat-up dirt roads. Mal Pais is pretty much in the jungle bordering the Cabo Blanco nature reserve. This is the dry season so the roads are really dusty and bumpy. Many of the locals who are either on ATV’s, bikes or just walking wear scarves or some type of dust-mask over their face to protects them from all the dust being kicked up by passing cars, trucks or buses. So for the most part, to an outsider it looks like there are bunch of bandits cruising around town. To the locals they recognize each other by choice of scarf or dust mask. Kind of like the wild west. We are staying in the town of Santa Teresa right across from the beach. Santa Teresa is rather large stretch of sany beach with a couple of different rock form reef breaks. To the south is Playa del Carman which is a mellower wave than Santa Teresa on a beach break as well. South of Playa del Carman is Playa Mal Pais. Mal Pais is a collection of reef breaks and little points with the occasional sandy inlet. There a handful of different types of waves around the Mal Pais and Santa Teresa area. The good news is the waves have been good all week and have only gotten bigger as a new south swell is starting to fill in. The first day that we got to Santa Teresa we all saw a family of howler monkeys cross over the path that we were walking on from the beach to our cabina. There were a group of about ten of them with a couple of babies. It was Eli’s first time to see monkeys in the wild and our families first time to see them since we have been in Costa Rica together, needles to say it was pretty cool. We have been taking a bunch of pictures but do not have the camera cord with us to upload them to the computer. Check back later for images.